So what’s a girl to do when you move to the West Coast but want to incorporate your East Coast upbringing into you engagement photos? You pick up the phone and make it happen! When we received a call from Gisela, she asked if we would be interested in taking engagement photos of her and her fiancée, Jacob. Of course we said yes!! The only specifics given were to capture some of her New Jersey upbringing. First Birthdays are always a big reason to celebrate. And what better way to do that than with a Cake Smash! With a quick a change Amelia was ready for her cake smash !!! She had a great time digging into that yummy cake. Todd and I loved the fact that her big sisters joined her at the end!!!!!! All our cake smashes are designed and unique for our clients. Cake smashes can be done at or studio or on location. We here at TLGreen Photography really enjoy photographing them and being part of such an amazing experience. Being a photographer is something that I have come to love. I cherish all the moments that we at TL Green Photography are allowed to be part of. Its amazing how being chosen to capture events lead up to things that you could have never imagine. When I first began shooting, I had no idea what kind of commitment it took to be the best. I did not know where to even begin! Over the years, I have met some SUPER great people that have helped me become the photographer that I am. Without these people, I don’t know where I would be right now. Today, I am lucky enough to have the opportunity to shoot two ladies professional sports teams…The New York Liberty and the Sky Blue FC Soccer Club. I do not directly work for these teams, but am lucky enough to get a season credential each year to shoot all home games. I started shooting soccer in the strangest way. I replied to an add on Craigslist that was looking for soccer referees. Speaking with the Dave, I told him that I was interested in shooting pictures. I told him that I would shoot with no fee to him. If people were interested, they could purchase them online. Well I sold ZERO!! I was not upset at all but looked at it as a learning process and went back to look at what I could do better the next time around. Dave and I became friends after a while and that’s when things changed. Dave introduced me to Oral. Oral used to play pro soccer and was a coach at a local girls academy. He invited me to come out and shoot the games If I would like to. I took the opportunity to “hone” my skills at shooting sports. I even volunteered to do a few events for the school free of charge. While my friendship with Oral started to grow, he introduced me to a friend who worked in media relations for Sky Blue. He invited me down to shoot a few games and it was all over. I don’t get down to shoot as many games as I did previously, but I still love the thrill of the game. So while shooing soccer one game, I met Denise. She was there shooting soccer too. We had struck up a conversation about the game and had fun shooting. She asked me if shooting sports was my passion….I said no, but I loved to shoot sports! She then asked me if I had ever shot basketball before and I told her no. She said” are you interested in shooting basketball”? Well of course I said yes. Little did I know she was talking about the New York Liberty! The first game was a doozy!! I had never been so nervous before sitting on the floor in front of thousands of people….that rush!! Denise is the founder of The Women’s Sports and Entertainment Network. Based online, this is where my pictures are posted. No Sports magazines yet, no wire services either. I am happy doing what I do with sports. This has not taken away from what myself and my wife Cecilia has created. We are Event Photographers and do a variety of things in our studio or out on location. Check out our website when you have time!!! Our friendship and journey with Jessica started 6 years ago. A mutual friend, Sheila, recommended her to us. Jessica was interested in taking portraits of her self for her 30th birthday party. We loved the fact that she wanted a session to celebrate not only that she was turning 30, but to capture the woman she had become. We kept in touch thru Facebook and two years later, Jessica got engage to Kyle!!! We were so delighted when we were asked to do their engagement pictures in Brooklyn. That was the first time we got to meet Kyle but we can see that they were perfect for each other. We were so happy and excited for both of them. Three months later Jessica and Kyle were married on a beautiful sunny day in August!!! It was small and intimate wedding. The room was filled with so much love and happiness. Jessica and Kyle had an amazing wedding day. Two years later, Jessica contacted us to let us know that she was going to have a baby!. She wanted us to capture her maternity session. Jessica arrived at our studio looking beautiful and radiant. Kyle later joined her at the end of the session to have some pictures done with her. They both looked so happy as they waited for their little girl to be born. On September 9th Katalina Janae was born. Three weeks later I had the opportunity to photograph this beautiful little angel. She was the perfect little model. It`s been such a wonderful journey with Jessica and Kyle. We hope that they keep including us as we continue to capture their memories forever. The Waterside, located in North Bergen, New Jersey was transformed into a Moroccan lounge for Giselle's bridal shower. From the moment guests stepped into the room, the vibrant colors and Moroccan decorations put the guests in a mood ready to party. Each table had a beautiful gold lantern surrounded by colorful flowers as their center pieces. Behind each chair hung vibrant hip scarves with cold coins that are used for belly dancing. Coaches and pillows were added to complete the space giving a lounging feel to the catering hall. The guests were able to try traditional Moroccan tea, have their hands painted by henna artists or try some hookahs at various spots throughout the room as they wait for the future bride to arrive. When Giselle arrived escorted by Kevin, she was surprised and amazed to see her family and friends there ready to celebrate with her Moroccan style. Gayza and her mom planned the perfect party for Giselle! After lunch, there was a belly dancer who performed and give the guests & Giselle some free belly dancing lessons. Giselle and her guests spent the afternoon dancing, talking, and enjoying each others company.We hope you enjoy the pictures as much as we loved being there to capture the party for Giselle. We are so excited to share Canice and Maribel`s wedding with all of you. Our couple was recommended to us by Cecilia's friend Nadia. From our first consultationat our studio, we knew that we had an immediately connection between all of us. Before we even finished our consultation with them, we knew that we wanted to be part of their wedding day. Todd and I were so glad that Canice and Maribel felt the same as we did!!!!! Canice and Maribel picked the perfect location for their wedding ceremony at the Davis Johnson Park and Gardens in Tenafly, NJ. What a gorgeous place to celebrate a beautiful day!. As the guest entered the gardens, they were able to walk around the beautifully maintained grounds until the ceremony began. After the ceremony was completed, we all headed to Axia in Tenafly. NJ for dinner with 40 of their closest friends and family. It was such an extraordinary day Canice and Maribel had. Their wedding was intimate, elegant understated and just perfect. It was so easy to capture the true essence of love, friendship and family at their wedding. Our only wish for Canice and Maribel is that they continue to be surrounded with friends, family and love for each other everyday. They are truly very special people. Lets all of us wish them well by commenting on the post. Glitz! Diamonds! Bling! That was Lauren's Sweet Sixteen party theme. There is no better place than New York City for her photo shoot. Our first stop was Central Park on a beautiful fall day The weather was perfect The park was filled with people enjoying the weather. That did not bother Lauren at all as she became the center of attention wherever she went! She looked stunning in her turquoise gown. The bodice of the dress was filled with diamonds that sparkled as the sun hit them. Here is her full photo shoot in the city that never sleeps NEW YORK CITY!! Until our next blog...have a great day!! One of our favorite aspects of photography is the clients that we meet along the way. They don't stay clients for long as they become part of our photography family. Two years ago, we photographed Priscilla and Michael's wedding. It was such a beautiful day filled with love, family and the promise of their future together. A new beginning, a step forward in their lives. Today we had the opportunity to photograph their son Alejandro's 1st birthday portraits and cake smash. We were thrilled when they called us to be part of such an important milestone in their lives. Priscilla had picked the perfect theme for her little boy. You are my sunshine !!! The set was beautiful, simple and bright. Alejandro really enjoyed taking his pictures until the cake came out. As we mentioned in one of our last posts, we love a very messy cake smash. This day ended up being the cleanest cake smashes we have done!. That did not matter, because Alejandro is definitely mommy and daddy's little sunshine. We hope you enjoy his pictures as much as we enjoyed taking them…… Until our next cake smash…..
We just love one year/cake smash sessions. Especially if they are really messy! Everyone meet Anastasia, the perfect little model with such a great smile that will light up any room. Her gorgeous pink dress was made out of her mom's maternity gown that she used for her own maternity shoot. Anastasia smiled and laughed thru out her session.When it was time for the cake, Anastasia was not afraid to dig in and get messy! When it came down to it, she loved every minute of it! I hope everyone enjoys the pictures as much as we did taking them. When we first met Vanessa, we knew that we she was a client that we wanted to work with. 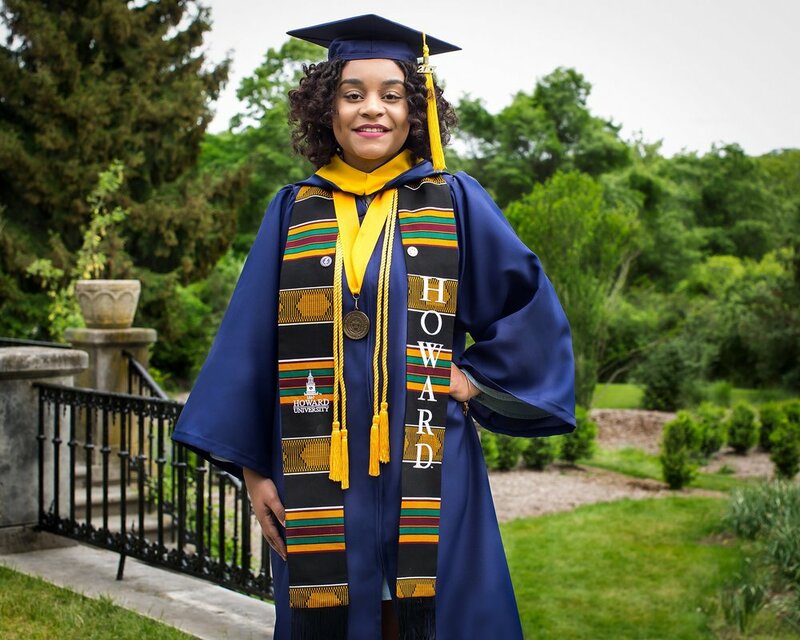 Fresh from graduation with Honors at #HowardUniversity, she along with her parents wanted to capture her with her cap and gown to have memories of that special day. Ringwood Manor was the chosen location for her shoot to take place. The day was perfect for our shoot and she did not disappoint with her posing skills! We want to wish Vanessa the very best in her future endeavors. Do not stop until you find that pot of gold at the end of the rainbow!